In this post we’ll take a look at Antoine Watteau’s painting The Love Lesson and explore its world of fragile elegance and melancholic serenity. A picture of a gentle, innocent afternoon; sky is clear blue with a few clouds that are as threatening as a little dog in the right corner. Sunlight gently hits the sleeping trees in this grove filled with laughter, music and leisure. Trees are captured in flickering, playful brushstrokes. Three ladies in pastel coloured dressed seem to be amused by a piece of paper, most likely a love letter. Two lads are keeping them company; a musician and the other one, with little moustaches, dressed in a blue cloak, pointing at a letter with amusement. The lightness and the seemingly easy-going nature of this painting is typical for Watteau’s style. 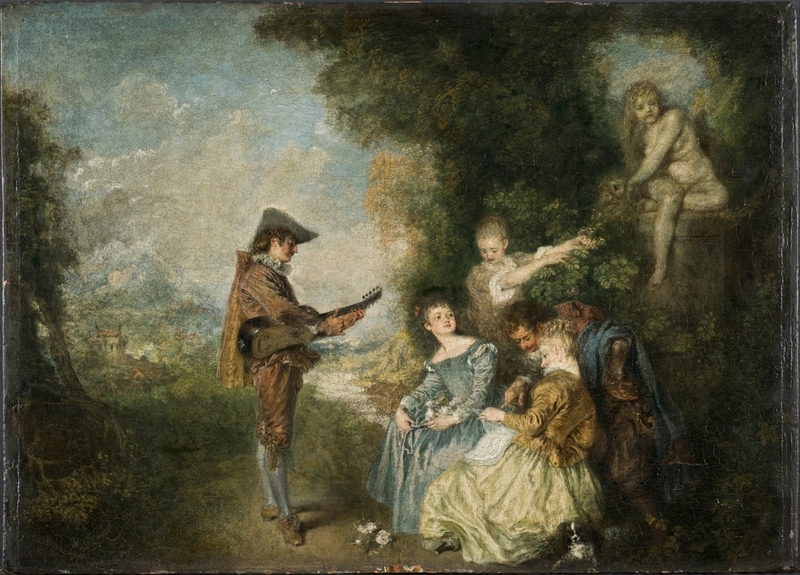 Jean-Antoine Watteau, the master of ‘fetes galantes’, was born on 10th October 1684 in Valenciennes but soon settled in Paris where he painted genre scenes for rich bankers and dealers. Today his paintings are considered not only as little masterpieces but also as the pioneers of Rococo style that would rule the majority of 18th century, but during his lifetime they were praised merely for their ornamental, decorative value. Rococo is not my cup of tea because it is a bit too decorative, too flamboyant, and, let’s be frank – too kitschy. Still, Watteau’s paintings are lighter, gentler and a certain melancholic serenity dominates their mood. Perhaps Watteau deliberately painted the simple pleasures of life and created a world that was so different to the mundaneness of his everyday worries; a world where shepherds hold hands with their shepherdesses, sweet scents and music are always in the air, a world of picnics in magical parks where it never rains, a world of cavaliers and pretty ladies in shiny silks. His reality was so much different; he lacked aristocratic clients and he was of fragile health, dying of consumption at the age of thirty-seven, just five years after The Love Lesson was painted. Still, in his visions of beauty there’s a hint of sadness that’s hard to define. Watteau knew the sweetness and the pleasures of life, but he also knew their short lasting nature. Love that is here today, may be gone tomorrow, beauty that charms the eyes of the beholders may soon vanish, and happiness rarely lingers. Awareness of the transience of beauty gave his art a certain intensity that’s lacking in other Rococo artworks.